In part one of this series we became acquainted with the fascinating document, Emeq HaMelekh and the role that five worthy men, Shimur Ha Levi, Haggai (Chaggai the Prophet), Zechariah son of Iddo, Zedekiah (Zidkiyah), Hezekiah (Hizkiyah), Hilkiyah, Ezra the Cohen, and Baruch son of Neriah the Scribe for the Prophet Jeremiah. Under the command of King Josiah during his reformation and cleansing of the Jewish Temple (Beit HaMikdash), the Torah was found. The temple was restored and the Feast of Passover was reinstituted, yet also after this time King Josiah instructed Jeremiah to institute a rescue operation for the treasures of Moses, David and Solomon that were in safekeeping in the temple. During this time the Wilderness Tabernacle was hid in a cave near the grave of Moses (Moshe) in site of Mount Nebo. There the Sanctuary (Mishkhan) with the Ark of the Covenant, the Stone Tablets of Moses (Moshe), Aaron’s Crown, the Ephod, Breastplate, Urim and Thummin, the Altar of Incense, the Menorah, the Qalal which held the ashes of the red heifer, the Sapphire Rod, the Silver Chest which held the garments of the High Priest and other temple treasures that had been stored in the Genizah of Solomon’s (Shlomo)Temple were stored in a concealed cave in the Valley of Achor. In this document we will explore the archeological explorations of Vendyl Jones as he searches for the Qualal and the ark at the Valley of Achor and the site of the search of Ron Wyatt below the Temple Mount (Haram As-Sharif). Here was the Genizah site below the Holy of Holies in Zedekiah’s (Zidkiyah’s) Grotto or Cavern deep beneath the Temple Mount in Jerusalem, known as the Royal Quarries or Solomon’s Stables with their underground tunnels that went from the Gate between the two Walls to the Valley of Passengers. This tunnel was last used as an escape route by King Zedekiah on the 9th of Av as the forces of Nebuchadnezzar were destroying the Temple of Solomon. Here in this valley is where Elijah was taken on an inter-dimensional journey on a fiery chariot just after he threw his mantle to Elisha the Prophet, Here also was the site of John the Baptist also with a special mantle, who introduced his followers to the mahout (baptism) of water and fire. The second temple of Zerubbabel in the days of Nehemiah was known to be deficient in several areas to Solomon’s Temple, especially since there was no anointing oil to anoint prophets or kings. The temple was eventually desecrated by the Syrian king Antiochus Epiphanes IV in the Abomination of Desolation which lead to the Maccabean Revolt, the restoration of the temple and the Festival of Chanukah (Hanukah) called the Festival of Lights. These are the vessels dedicated and concealed when the Temple was destroyed: The Tabernacle and the Curtain, the Holy Menorah, the Ark of Testimony, the golden forehead Nameplate, the golden crown of Aharon the Cohen, the Breastplate of Judgment, the silver Trumpets, the Cherubim, and the Altar of burnt offerings, the Curtain of the Communion Tent, the forks and the bread molds, the Table [of the Showbread], the Curtain of the Gate, the Copper Altar, the sacred garments of Aharon which were worn by the Cohen Haggadic (High Priest) on the Day of Atonement, Pa'amonim (bells) and Ramona (pomegranates) on the hem of the robe [of the Cohen Gadol], the holy vessels that Moses made on Mount Sinai by the command of the Holy One, the Staff, and the Jar of the Manna. After the House of the Lord was dedicated, according to the traditions of the Jews, the Sanctuary of the Congregation was kept in a guarded and sealed area below the Temple premises, in a virtual museum as the guarded treasure of the heritage of the Israelite people. There beneath the two giant golden cherubim with arching wings shielding it for twenty cubits from one wall to the other, the Ark of the Covenant was placed. The walls of the shrine were radiant as the Glory of God flashed with a golden aura, dancing off the silhouettes of the carved relief images of cherubim, palms and calyxes on the walls and ceiling of the golden lined Inner Shrine. (1 Ki. 6:27-36) Within the Ark was contained only the Tables of Stone that the Lord of host had given to Moshe (Moses). The Lord of hosts had now placed or anchored His Sefirot, or His Image, of the World of the Divine and as the ancients described, dwelled within the Temple of Solomon. Here the Lord of hosts literally brought the ‘Kingdom’ of the Lord, called the Malkhut in the mystical traditions of Judaism, in the Shrine of the Holy of Holiest. In Hebrew, the root word for Shekhinah is Shakhan, which literally means “He dwelt.” The Mishkhan or Tabernacle actually meant “The Dwelling Place of the Divine Presence.” Here the Shekhinah came home and the Lord dwelt within the Temple built for Him. Upon the dedication of the Temple, after the Ark of the Covenant had already been placed in the Holy of Holiest, the Divine Presence moved from the Mishkhan, the Tabernacle of the Congregation in Gibeon to the Inner Shrine in the Temple. Solomon then sent the Levites to the High Place in Gibeon, where King Solomon had initially offered sacrifices to the Lord of hosts. It was there that he asked the Lord for ‘wisdom’ to rule God’s people. (1 Ki. 3:2-15). There the Levites disassembled the Tabernacle and brought it also to Jerusalem and placed it in the quarry beneath the Temple complex. According to the Mishnah III and Rambam II, in the section Parah, it was written that the Tabernacle of the Congregation and Qalal [Ashes of the Red Cow] were positioned "Deep, deep below the outer court of the House." This would place the location of the entombed Tabernacle, in Solomon’s Genizah, in the Grotto carved out of the mountain between the Temple. There the Tabernacle was positioned directly under the site of the Inner Shrine where the Ark of the Covenant was located in the Holy of Holiest directly above. Here was a living symbol, an earthly type/anti-type of a greater type/anti-type in another spiritual dimension called the Heavenly Tabernacle. As the earthly Temple on top of Mount Moriah rested the Wilderness Tabernacle deep within the bowels of the mountain, so also the Israelite could envision the heavenly Sanctuary in that spiritual dimension resting over the Temple of Solomon. When did the Shekhinah Glory of God leave the Holy of Holiest? We do not know. What is at the division of the kingdom into the Northern and Southern Kingdoms? Was it at the invasion of Jerusalem by Sheshank, the Pharaoh of Egypt when the Ark of the Covenant was secreted down to an undisclosed location? What we do know is that the Ark of the Covenant was not in the Most Holy Place at the end of the reign of the wicked but later repentant King Manasseh and that King Josiah, his son, had it brought out of the secret dwelling place within the bowels of the Mount beneath the Temple. What we do know it that neither the Shekhinah Glory nor the Ark of the Covenant was within Jerusalem when the forces of Nebuchadnezzar encircled the city at the first invasion in 605 BCE. What we now know, we have an inventory near the time of the fall and destruction of Jerusalem of what remained in the National Museum of the United Monarchy of Israel of their most prized and treasured possessions, the relics of the Wilderness Tabernacle built by Bezaleel under the direct supervision of Moses, using the blueprints given direct by the hand of the Lord of hosts. · The Wilderness Tabernacle and the Curtain that separated the holy and sanctified premises of the tabernacle complex. · The Holy Menorah or golden seven candled candelabra. · The Ark of the Testimony (Covenant) which housed the Tablet engraved by the laser finger of the Lord of hosts. · The twelve jeweled encrusted Breastplate of Judgment that was worn on the chest of the High Priest with the Urim and the Thummin. · The silver trumpet, a metal so rare in the golden kingdom of Egypt that its worth was far greater than the gold of Egypt. · The Curtain of the Communion Tent. · The forks and the bread molds. · The golden Table of the Showbread. · The Curtain of the Gate or the prized curtain in Egyptian gold that separated the Holy Place from the Most Holy Place. · The sacred garments of the Aaron that were worn by the High Priest on Yom Kippur, the Day of Atonement. · The Pa’amonim or bells and the Remain or the golden pomegranates sewn on the hem of the Cohen Gadol (High Priest) so that the Levites would know that he was still alive when he was ministering in the presence of the Lord in the Holy of Holiest at Yom Kippur. · The holy vessels that Moses made on Mount Sinai by the direct command of the Lord of hosts. · The staff, possibly the Sapphire Staff that was given to Moses by the Angel of the Lord at the Burning Bush. · The jar of Manna. 11 Maccabees 2: 4-5 - “It was also contained in the same writing, that the prophet (Jeremy), being warned of God, commanded the tabernacle and the ark to go with him, as he went forth into the mountain, where Moses climbed up, and saw the heritage of God. Are the official records and the memoirs of Nehemiah, the same as the Book of Chronicles and the Book of Nehemiah in the Old Testament or the Hebrew Tanakh? Where is the Library of Nehemiah? Where is the Library of Judas Maccabees? These libraries have yet to be discovered though archeologists have been searching for them in the vicinity of Qumran. It is still the disputed yet consensus that Qumran was the site of the main commune of the Essenes, the third party of the Jewish people. As ultra-orthodox, they were firm in their belief that the purity of the priesthood in the Herodian Temple had been defiled by the Herodian and Sadducean family hierarchy. They were using the temple as the greatest money laundering and scam operation in Jewish history, all in the name of their Lord. As such, the Essenes, who were contemporary and probably the party of John the Baptist and Y’shua his cousin, believed and wrote in all their writings that the purity of the priesthood and the restoration of the Temple would be still the future to their day. It was in the Jewish year 3323 that the Prophet Jeremiah gave instructions to Good King Josiah that it was imperative to remove the Ark of the Covenant from the Holy of Holies in the Temple of Solomon. The underground chambers below the Temple complex were lined with grottos and tunnels; the largest called Solomon’s Stable, which is the size of several soccer fields. These man made grottos were adjacent and contiguous with the natural cavern system hidden deep in the recesses of Mount Moriah. 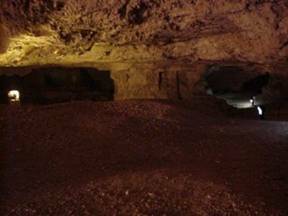 These limestone caverns, similar to the Mammoth cave system in the state of Kentucky, traverse for many miles, most of which have not been explored fully to this day. Being in an active seismic zone, in which many earthquakes have been recorded throughout the millenniums, many of these caverns have now collapsed, while many of them were sites where the limestone was quarried to be used for the construction of the Temple. The main cavern system known today begins a few meters north of the Damascus Gate on the northern side of the present Temple Mount in the grotto entrance that a few years ago could be explored in what was known as the Cave of Zedekiah. This entrance is now closed, but this natural cavern system apparently traveled eastward directly under the Temple Mount, then under the Kidron Valley, the Mount of Olives and finally descending downward for almost 30 kilometers (about 19 miles) towards the Dead Sea. There it finally exits at Emeq Achor (Valley of Achor). Today this exit is concealed. Zedekiah’s Cave was first rediscovered in 1854 by an American physician, Mr. Barkley and his son as they followed their dog that disappeared into grotto’s entrance near the northern wall of the Temple Mount. One hole after another and this physician became the first modern explorer of this grotto and cavern system. Though most scholars believe that the present day grotto extends only from the northern wall to under the center of the Temple Mount, more recent explorers including Ron Wyatt and Vendyl Jones testify that that this cavern system is pocketed with other tunnels, now partially blocked traversing to regions unknown. According to Maimonides, the sanctity of the Temple area remained even though the physical temple had been destroyed. Here the Grottos were called the Inner Court of the Temple and they could be defiled by entering into the inner sanctum below the Holy of Holiest. “Even though the Temple is destroyed…a Jew is obligated to revere the Temple as if it were built. Only enter the permitted places and do not sit in the Azarah…as it say, ‘guard My Sabbath and revere My Temple’, just as the Sabbath is forever, so too is the reverence for the Temple eternal, even though it has been destroyed. Within the cave itself is evidence of three types of limes, the pure white massif limestone, called “Melekh” for King or Royal Limestone that was used in royal, religious and diplomatic buildings as it was soft enough for carving but would not flake. Near the entrance is a denser and softer limestone, called “Missi-helou” or ‘sweet’ limestone used for smaller ornamental work. Then there was a ‘red’ limestone impregnated with iron ore that was called “Mizzi-Yehudi” or ‘Jewish’ limestone that is commonly used in building construction even today, giving Jerusalem that pink hue as it reflects the sunrays on a clear evening at dusk. "Jerusalem, as is well known, is honeycombed with excavated caves, natural caverns, cisterns cut in the rock, subterranean passages and aqueducts…..In its underground chambers and catacombs it is richer than any known city. In Jerusalem the excavated chambers and caves were for three purposes. Some of them, especially the Bahr el Khebar were for the supply of water. Those outside the city were for burial places, while those under the city, the vast caverns known as the ‘Royal Quarries’ were actually used as quarries for the stone used in building. The entrance to them is by an opening so low that it is necessary to stoop, but the height rapidly increases……..The evidence of the place having been used as a quarry are very plain and numerous, the cuttings about four or five inches wide still remaining, and on the left hand side of each cutting may be observed a little hollow formed at the corner into which a wick and oil lamp may have been placed. The entrance to these caverns, known also by the name of "Solomon’s Quarries" because it is supposed that the stones for the Temple were prepared there is a little to the East of the Damascus Gate and opposite to Jeremiah’s Grotto." “But of all the objects of interest which met my eye during my tour of the walls, none was more thrilling than the "Great Cave" beneath Jerusalem, the entrance to which is just east of the Damascus Gate. In constructing the north wall of the city, the Hill Bezetha has been cut through the solid rock to the depth of forty feet, the excavation having been extended 600 feet east and west, and 450 north and south…. Accompanied by the American consul and a single servant, we entered the cave without difficulty, and, lighting our wax tapers, proceeded along carefully for a hundred feet, when we began rapidly to descend. To our surprise, on our right sat an Arab maiden who had become the sibyl of the cavern, surrounded by several natives, to whom she was delivering her sibylline oracles. Rapidly descending toward the southeast, we soon found ourselves in a cave three thousand feet in circumference, more than a thousand feet in length, and more than half that distance in breadth. The air was damp; the darkness that of a ray less night; the ground on which we walked was strewn with the chippings of the quarrier; the walls around us were marred with marks of the chisel, and the ceiling above us adorned with stalactites of a rose-color hue, from which trickled the percolating waters of the city; while, disturbed by our approach, bats screamed their grief and flapped their long black wings against their solid nests. Moving southward, we came to the verge of a precipice a hundred feet across and fifteen feet deep, on the bottom of which the skeleton of some lost explorer had been found. Threading a long gallery on the left, we saw a fountain as deep as it was wide, partially filled with water strongly impregnated with lime. Turning eastward, we entered a second gallery of greater depth, in the sides of which are immense blocks of limestone, in part detached from their native bed, just as they were left by the unknown quarrier thousands of years ago. Here, as elsewhere, were the unmistakable marks of a broad chisel-shaped instrument, evidently used to detach the blocks on either side and at top and bottom, and then by the pressure of a lever the mass was broken off from the rock behind. Occasionally we passed huge pillars supporting the ceiling above, and in several instances saw blocks hewn and squared ready to be hoisted to their destination. On the right and left winding passage-ways led us to noble halls, white as snow, and supported by native piers, on which are engraved the cross of some Christian pilgrim or knight of the Crusades; and on the sides of the chambers are Hebrew and Arabic inscriptions, the memorial of some wandering Jew and some conquering son of the Prophet…. “This vast cavern is located underneath the Muslim section of the city, extending 750 feet into "Mt. Moriah", and beginning at the trench or dry moat separating the northern and southern portion. It is 325 feet wide at the maximum point and the average height is almost 50 feet. It was clearly a stone quarry, but at what point it was in use, we really do not know. There are those who believe its stone was used in the first temple, and that may be true. But its existence was not a well known fact and most likely it was always kept completely sealed for fear of any enemies trying to tunnel into the city. So little is known for sure about the giant quarry, but one point everyone agreed on was the fact that there was no entrance into the city from the quarry. Viewing the diagram (below) of its layout, the dark areas are pillars of solid rock left in place to support the ceiling, like the pillars left in a coal mine. As the miners work their way back out of the mine after depleting it of all it's coal, they remove these pillars of coal and the mine usually caves in. These were obviously left in place to prevent the cavern from collapsing since part of the northern city is above it…..
Ron wondered it there were any tunnels leading from the quarry. If so, perhaps the Ark and other items had been lowered through the hole from the area north of the temple mount into the cavern, and then through a tunnel to its present location. So he began to look for tunnels. And sure enough, he found one. In 1874, a French archeologist, Charles Clermont-Ganneau explored the cavern system making sketches and drawing of the site. He discovered a carving on the wall near the mouth of the cave depicting a cherub, the winged, lion-like creature described in the Bible as part of the Ark of the Covenant and whose motif is found in the royal palaces of Assyria, Babylon and Persia. The Ivory Palace of Ahab in Samaria had similar carving left in ivory as reflected in comparison and reflects the iconoclastic images used in the First Temple period. This etching was removed at taken to the Palestine Exploration Fund Offices in London. There is also some suggestion of early burial caves here. The cave opening is beneath the north wall of the Old City of Jerusalem; close to the Damascus Gate. From the entrance, the main path leads south for nearly 225 meters (~740 ft) till it reaches the main large cave called "The Freemasons Hall." From this hall, it bears east, leading to the dripping spring and the lowest place of the cave. The known area of the cave is about 900 m² (~10,000 square feet)…. This cave, since the days of the British Mandate, was used in the yearly august ceremony for the consecration of the Supreme Grand Royal Arch Chapter of the State of Israel, with the exception of the years from 1948, when the British were driven out by the Israelis, to 1968, after the war of 1967, when the Israeli once again had possession of the entire city of Jerusalem. Also yearly the Mark Master Mason ceremony is conducted. As inscribed in the Copper Scroll, they were hid in the last chamber on the western wall of the cavern system beneath the Cave of the Column. According to the translators, an artificial bonding wall was created to seal the exit to Zedekiah cave and produce a camouflage so that only a small exit escape shaft, well hidden, to allow the remainder of the treasury guardians to escape. In the Jewish year, 3331, nine years later, the Lord of hosts instructed the Prophet Jeremiah that he and over 250 of the fittest Levites in the Land of Israel were to begin an ultra-secret mission to hide the national treasures of the Israelite people which were built by Moses on the plains around Sinai and King David in preparation of building the Temple of Yahweh. The first mission was conducted by the Prophet Jeremiah himself. A small and select contingency of Levites probably under the command of the most carefully selected Tzaddiks in the country, Shimur HaLevi, Zedekivahu, Yizkiyahy, Chaggai the Prophet and Zachariyah the son of Iddo the Prophet were selected to carry the Mishkhan, the Wilderness Tabernacle, the Menorah that was engraved by the Master Craftsman, Bezaleel, the golden nameplate that went on the forehead of the High Priest, the golden crown of Moses’ brother, Aaron, the High Priest, the Breastplate with the Urim and Thummin, the sacred oracle stones which God communicated with the High Priest including the all the articles used in the service of the Wilderness Tabernacle, the garments of the High Priest, the vessels of gold made by Bezaleel under the instructions of Moses, the Staff of Aaron and the Golden Jar of Manna and to deposit them in a specially designed cavern with false walls and fronts to seal it off from the enemies of the Lord. The history of the Jewish people are consistent in their legends that King Zedekiah, the last king of Judah, tried to escape the Babylonian siege, following a secret tunnel from here all the way to Jericho. 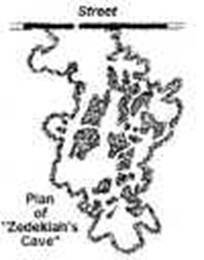 Redak and Rashi, Talmudic scholars, wrote that it was the intention of the Lord of hosts that Zidkiyah was to be caught by the Babylonian. As states, "There was a cave from the palace of Zedekiah to the plain of Jericho and he fled through the cave, and G-d caused a buck to walk on the roof of the cave and the Chaldeans followed the buck. When they reached the cave opening in the plain of Jericho, Zedekiah was emerging. They saw him and captured him." A fascinating account of exploring this tunnel system by Vendyl Jones and his son was recorded in an article called The Gate between Two Walls, our first discovery. In this article records the first discovery of the Gate between Two Walls. For 2390 years there is no historical record of the whereabouts of this gate until 1967, the Jewish year 5728, just after the Jewish people took full possession of the city of Jerusalem. The exit to this cavern system that ascends up the mountain terrain back towards Jerusalem is unknown, but many scholars suggest that it is the exit from the Cave of Zidkiyah, where the king of Judah fled that fateful day. Some sources state that the exit opening is over 7 meters high (23 feet) and 20 meters (66 feet) wide. In the days of Moses, this would have been a gaping hole or grotto in the sides of the mountain, quite visible from Mount Nebo five miles on the other side of the Jordan River. "Not far from the Bab al Amud, is the cave of Zedekiah, which extends under ground to the mountains near Jericho. Several persons told me, that they themselves had walked a mile in the same. It is so spacious that a man on horseback with a lance in his hand can ride through it quite comfortably." Less than a mile north of Bab al Amud, is a sepulchral monument in a cave called the Kalba Seboa, recorded in Gittin, 56a, is suggest by many to be the cave of Zedekiah. It is recorded that in 5607 (1847 CE), a group of Arabs were digging in the vicinity of this cave when they stumbled upon a vault buried deep in the ground that filled with gigantic human bones, of a race of humans with great stature. The Pacha halted and forbad any further digging and the cave was closed up. This area is recognized as an area with sepulchers of kings. One-half mile north of Kalba Seboa, is another sepulchral cave with dual chambers on top of another, in which carved in the bedrock are seventy niches, called the cave of the Seventy Sanhedrin. This manner of burial, with sepulchral vaults in niches above and alongside each other, is described in the Mishnah of Baba Bathra 6, §8. Yet who were the Seventy Elders, what era, and whether this was used for some other social group or family. How can this be explained? As we have noted prior, the Ark of the Covenant was a small portable ark and we do not know whether another ark was built for the Holy of Holiest in which the Ark of the Covenant may have resided within. Many ancient traditions state that duplicate Arks were built, the most famous, as some have suggested, was a duplicate Ark was built for the son of Solomon and Makeda, the Queen of Sheba, whose capital city was Axum, Ethiopia. It was their son, Menelik, called Bayna-Lehkem, who became the eventual ruler of Ethiopia, yet accomplished the biggest heist in religious history, which according to The Kebra Nagast, a thirteenth century documents, the abduction of the Ark of the Covenant, which in this manuscript does not record any duplicate, instead, they replaced the Ark with a pile of lumber, hid under the covering of the Ark..
As yet, the record of the Emeq Ha Melekh appears to have the most authenticity and reliability of any ancient record concerning the final resting place of the Sanctuary of the Congregation and the Mosaic Ark of the Covenant. Here the final resting place of the Ark is in the Valley of Achor. Is it not of coincidence that John the Baptist, with his mantle of camel’s hair, carried the torch and power of Elijah, who also carried with him an identical camel’s hair mantle? According to the Talmud, the mantle of Elijah along with the tunic of the High Priest was kept in storage in the Ark of the Incense in the Wilderness Sanctuary. It this the same as the Altar of Incense that Jeremiah placed in hiding near the Mount Nebo and the grave of Moses? (11 Maccabees), (Ibid 121) Is this Altar of Incense the same as the Altar of Burnt Offering as recorded in the Emeq Ha Melekh? Did the Essenes have access this Altar of Incense/Burnt Offering and was the mantle of camel’s hair by John the Baptist the same mantle of Elijah, the greatest prophet of Israel? re-establish a foothold back in the land of their forefathers and to erect a new Temple to the worship of the God of their fathers, Abraham, Isaac and Jacob. 2:5 - “According to the word that I covenanted with you when ye came out of Egypt, so my spirit remaineth among you: fear ye not. 2:9 - The glory of this latter house (Later date to the Temple of Zerubbabel, which was called the Ezekiel Temple) shall be greater than of the former (former to the Temple of Zerubbabel, the Temple of Solomon) , saith the Lord of hosts; and in this place will I give peace, saith the Lord of host. Yet a little notice wording in the Book of Haggai, suggests part of his message was about a later and more glorious House of the Lord. Yet, since the building of the Second Temple, the word of the ancient Hebrew prophets was silenced. The Rabbabim in the Land of Israel are adamant to a voice that a prophet has not arisen with the people of Israel since the days of Ezra, Zechariah and Haggai. What we now know, there was no anointing oil and so no prophets were ordained to their prophetic role. There was no anointing oil and so no kings were anointed to the throne of Judah. The Temple of Zerubbabel served more of a political national identity for the rulers of Judah and for the Jewish people as a nation. The Silver Chest which included: the garments of the High Priest Aaron, the Breastplate of twelve polished gemstones, the Ephod of the High Priest, and the Urim and Thummin where the High Priest had access to direct communication from HaShem. The Glory of the Lord in the focal presence of the Shekhinah flame on the Ark’s mercy seat. During this time, the Maccabean family called the Hashmonean did restore the Land of Israel to an autonomous era to the people of Israel, after decisively driving out the Syrian leader who was persecuting the Jewish population, Antiochus Epiphanes IV. It was this Syrian ruler who also desecrated the Temple in Jerusalem, by sacrificing a pig on the altar in Jerusalem, in 175 BCE and converted the Temple into a sanctuary for the god Jupiter. This act of desecration, call the Abomination of Desolation, required that the temple complex undergo ritual purification and cleansing. Only after the temple and the Levites were cleansed in 165 BCE did the Jews participate in the joyous celebration of Chanukah. The Festival of the Lights, celebrating the day when the Great Menorah was relit for the first time when they had only enough purified oil for the lamps for one day. Miracles upon miracles, the Menorah remained lit for an entire eight days. It was the Essenes that recognized that the Temple was to be controlled by a corrupt and illegitimate priestly family, who bought and sold their position as the High Priest of the Temple first from the Greeks and later from their Roman appointed rulers. These families included: House of Annanias (Hananiah), the House of Jason, the House of Katros (Caiphas) and the House of Ishmael Ben Phiabi. According to the Talmud, “Because of these wicked priests, Heaven decreed the destruction of the Second Temple.” And so the Lord of hosts prevented the Guardians of the Temple treasures from restoring these treasures to the Jewish people. They took the secret of where they hid the temple treasures to their graves, except for leaving behind a record of where these treasures were hidden: on a Copper Sheet, two marble tablets and the parchments that were preserved in later years in the Masakhet Keilim, and Tosefta (addition) to the Talmud about the 8th century CE.